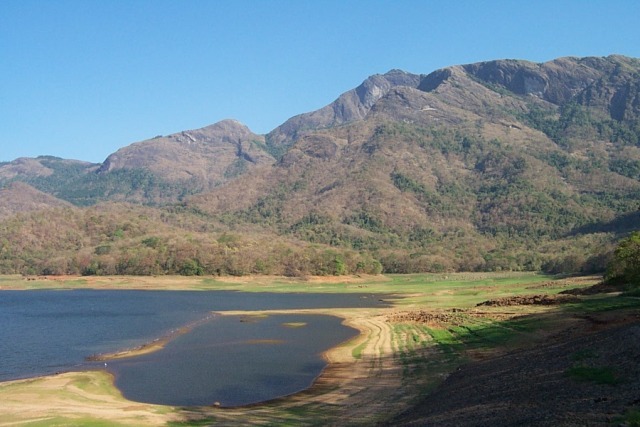 Pothundi is a kaleidoscope. There are as many angles to view in it as there are moods the beautiful earthen dam can evoke in us. You can run through the gamut of time, or slide along the road that nestles it and stop at different points; you’ll always get fresh views and experiences. I saw it first time, a decade back, when I was working in Palakkad. Pothundi is near Nenmara village(8kms away). 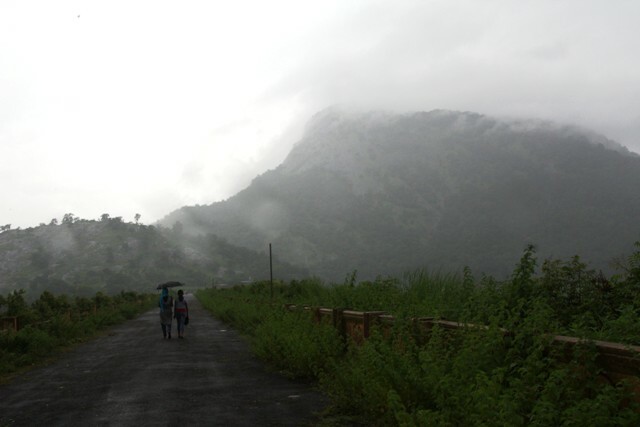 It is handsomely located on the way to Nelliyampathy, ‘the poor man’s Ooty’. When I first saw it, the slanting half of the dam which teeters towards the water was red hot under a scorching March sun. The sky was blue without a hint of a cloud. The wind did not whisper. Water was minimum. The marks on the shore where it once lapped around looked like wrinkles on the skin of old men. 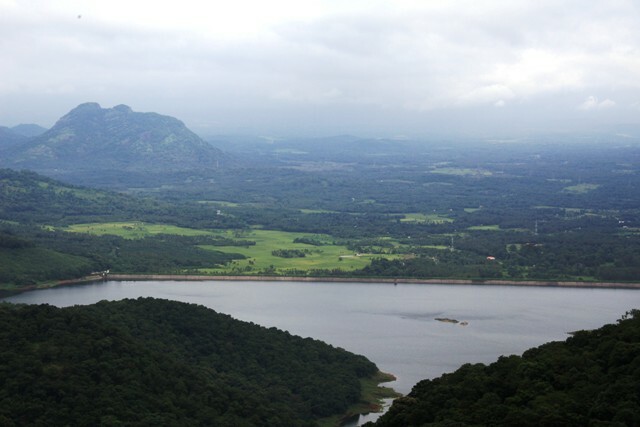 The irrigation dam at Pothundi was built in 19th century. It is made up of a mixture of jaggery and quicklime, without a trace of concrete. You would wonder how the funny mix could counteract all that pressure water exerts during a monsoon. But it has been doing it all these years for more than a century (Don’t connect it to Mullapperiyar and read me a riot act). Unlike my last trip a decade ago I am not here now with my friends; here’s but my family – my wife and daughter. There’s a game that married men resort to when they take their families out and trace the steps of their bachelor-lives. They sing aloud how much adventurous they once had been before marriage befell, before they became just house-hus. “See, here’s where I saved him from drowning. Over there, he said he wanted to swim; but I said no. The elephant came this near to me, dear (and it ran). Your achan was so particular about that so his friends finally had to comply.” Like that it goes. 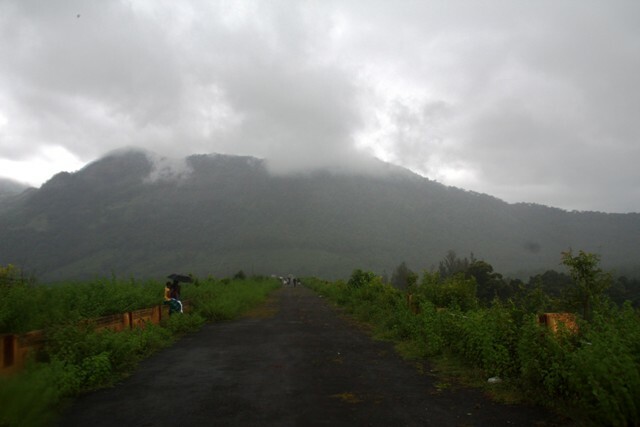 My journey this time to Palakkad is awashed with rains, and it does not abate a bit when we reach Pothundi. Outside the damsite, I pull over my car to the roadside to have a hot tea from a shack. My wife, Divya just wants plain rain (unmixed with tea) and that too through the window glass. So my family remains in the car while I sip the hot tea smiling copiously at the local people. They talk about rain, this sudden rain, which has already grown into a nuisance. The other day they could be cursing it for not coming. Now for coming. 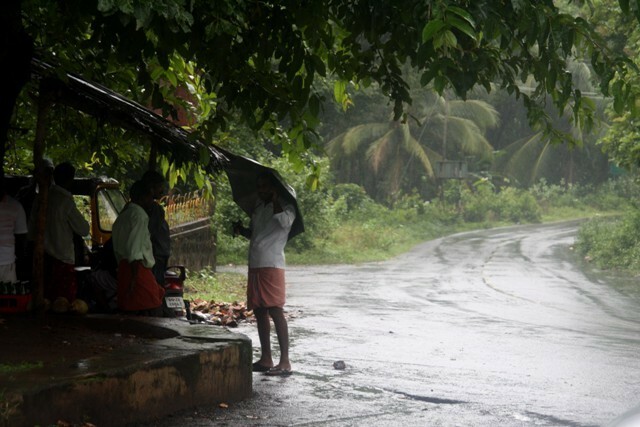 A rain can never satisfy a malayalee either way. After taking the ticket we walk into a beautiful park, which is aesthetically done, with a statue of a dancing girl in sheer abandon welcoming us. There are other statues as well: the ones of an old couple can never go unnoticed. With its lush vegetation, colourful flowers and buds the park is washed crispy green by the rain; this is definitely new, this park is not in my memories. We climb the steps to the top of the dam; there are cattle grazing on the vegetation along the slope of the dam now grown abundant because of the showers. Ah! 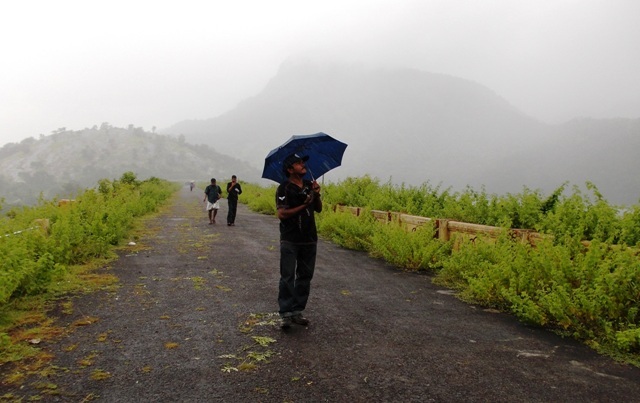 To be on top of the Pothundi dam under a warm blue umbrella on which rains pitter-patter incessantly is an experience, I’ll hardly forget. This is far from the journey I made ten years ago. Sun seems to be a distant memory to this place where I stand now. Divya’s camera shoots continuously; her complaint is that I seldom figure in my travel photos(How else can I when I make those solo journeys!) So this time she is with me; she will compensate for all that. Something else catches my attention. A couple in the rain. How romantic it would be for them to sit here for hours, under the rain, under an umbrella which hardly shields them from a naughty rain which has suddenly begun to slant and vapourize, fume and powder with a resolve to soak everything that is dry. I look at them with delight as they warm themselves in this cold rain against a dream which smolders in their eyes. We too sat like this. But far away from here. See…I want to show them; over there she walks, the one who sat with me under my umbrella. Near her walks my daughter who then was just a mere dream we used to share. Almost after an hour we come down from the dam; get into our car and begin our journey towards Nelliyampathy. 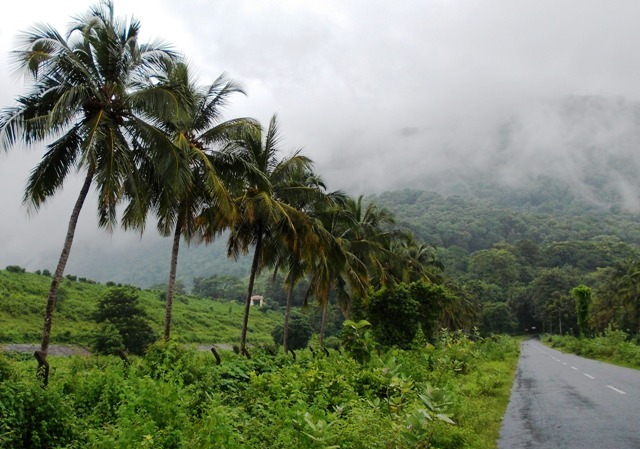 On one side of the road there is a row of coconut trees guarding the dam like tall sentinels radiant with the rain. As the car moves further my daughter stretches her head out through the window to see the last of Pothundi. Wait Ammu, wait. You haven’t seen her all; I smile as I drive along the sparkling road. The white mist at the top of the mountain seems to smile back secretly, just to me. We’ve seen each other before. A couple of hairpin curves away I stop the car and ask my daughter to pull down the glass. Instead Ammu opens the door and gets out. She might never have seen a place more irresistible than this, not even among the wallpapers she used to shuffle every day on her computer. Could those be wisps of regret in her eyes for being angry at her father when he asked her to shut down her virtual world and get to the real roads along with him for a 4-day journey through Palakkad? Or could those be of some deeper gratitude of being born into this beautiful world; of being waken up from a sleep by a couple who dreamed a lot under the rains, long long back? I sigh. ← Freekick: No More Parties Please! Arouses the old memory of a trip to Pothundy but never reached. Always plan another one to Nelliampathy, touching Pothundy, again never took place! Sir, you must go during the rains to catch the best of Nelliyampathy.